Nominations for the 2019 contest will be accepted from April 17 through June 6 via online nomination or mail-in. No e-mail, social media or call-in nominations will be counted. Judging is then completed during the summer and early fall. The winner and runners-up are announced in October during National Pork Month! Restaurant owners: You can’t nominate yourself, but you can download this promotional poster to display in your establishments and encourage nominations. 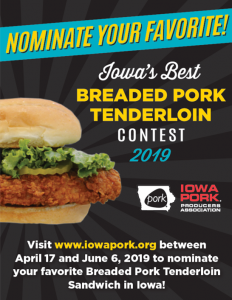 The Iowa Pork Producers Association has held a Best Breaded Pork Tenderloin contest each year since 2003. Check out this complete list of restaurants that have won or have placed in the annual contest.